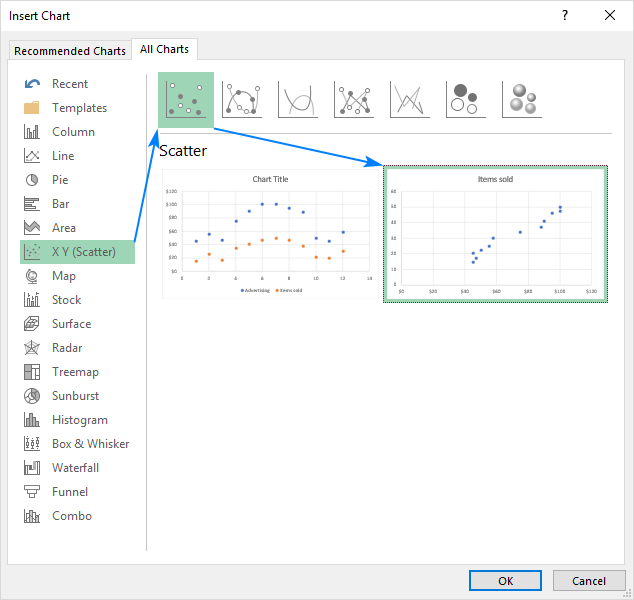 In this tutorial, you will learn how to do a scatter plot in Excel to create a graphical representation of two correlated data sets. When looking at two columns of quantitative data in your Excel spreadsheet, what do you see? Just two sets of numbers. Do you want to see how the two sets are related to each other? The scatter plot is the ideal graph choice for this. A scatter plot (also called an XY graph, or scatter diagram) is a two-dimensional chart that shows the relationship between two variables. In a scatter graph, both horizontal and vertical axes are value axes that plot numeric data. Typically, the independent variable is on the x-axis, and the dependent variable on the y-axis. The chart displays values at the intersection of an x and y axis, combined into single data points. 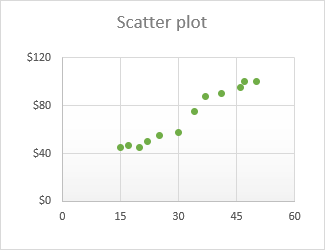 The main purpose of a scatter plot is to show how strong the relationship, or correlation, between the two variables is. The tighter the data points fall along a straight line, the higher the correlation. 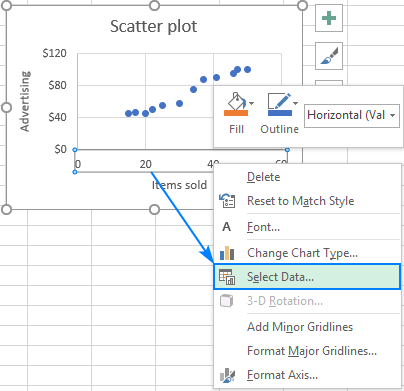 With a variety of inbuilt chart templates provided by Excel, creating a scatter diagram turns into a couple-of-clicks job. But first, you need to arrange your source data properly. As already mentioned, a scatter graph displays two interrelated quantitative variables. So, you enter two sets of numeric data into two separate columns. For ease of use, the independent variable should be in the left column as this column is going to be plotted on the x axis. The dependent variable (the one affected by the independent variable) should be in the right column, and it will be plotted on the y axis. Tip. If your dependent column comes before the independent column and there is no way you can change this in a worksheet, you can the swap x and y axes directly on a chart. 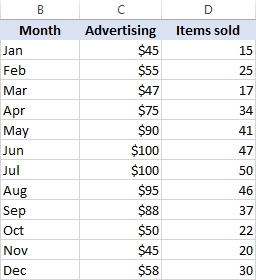 Select two columns with numeric data, including the column headers. In our case, it is the range C1:D13. Do not select any other columns to avoid confusing Excel. Basically, you may consider the work done. Or, you can customize some elements of your graph to make it look more beautiful and to convey the correlation between the two variables clearer. The Excel XY plot templates can also draw each variable separately, presenting the same relationships in a different way. For this, you should select 3 columns with data - the leftmost column with text values (labels), and the two columns with numbers. 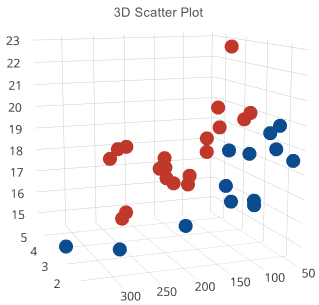 Unlike a classic XY scatter chart, a 3D scatter plot displays data points on three axes (x, y, and z) in order to show the relationship between three variables. Therefore, it is often called an XYZ plot. Positive Correlation - as the x variable increases, so does the y variable. An example of a strong positive correlation is the amount of time the students spend studying and their grades. Negative Correlation - as the x variable increase, the y variable decreases. Ditching classes and grades are negatively correlated - as the number of absences increases, the exam scores decrease. 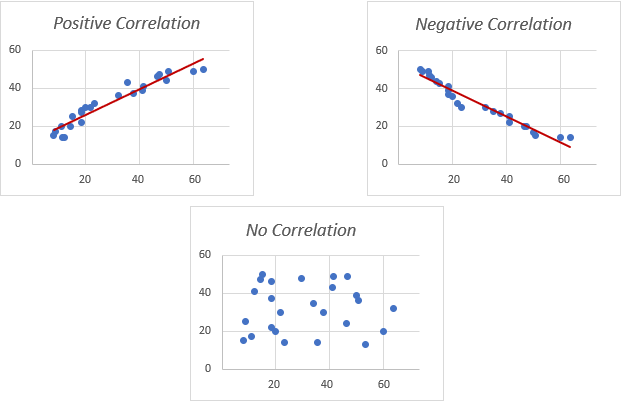 No Correlation - there is no evident relationship between the two variables; the dots are scattered around the entire chart area. For example, students' height and grades appear to have no correlation as the former does not affect the latter in any way. 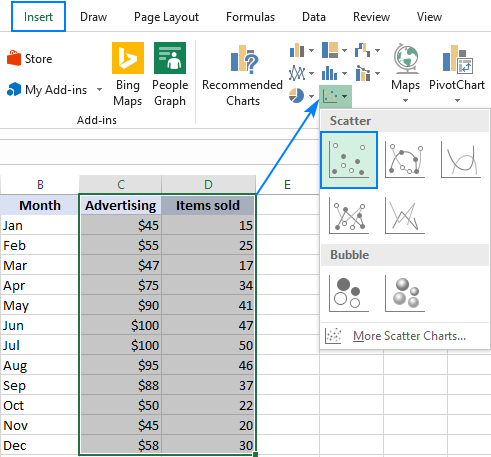 As with other chart types, nearly each element of a scatter graph in Excel is customizable. You can easily change the chart title, add axis titles, hide the gridlines, choose your own chart colors, and more. Below we will focus on a few customizations specific to a scatter plot. In case your data points are clustered at the top, bottom, right, or left side of the graph, you may want to clean up the extra white space. 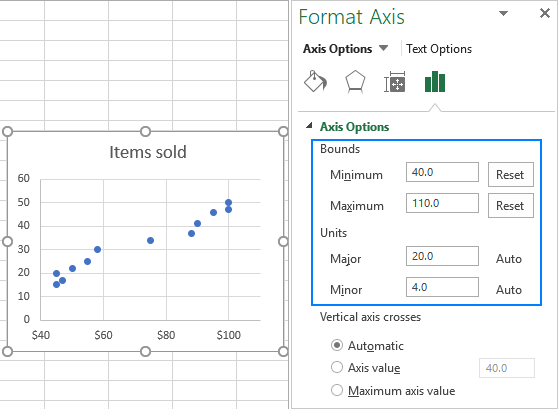 On the Format Axis pane, set the desired Minimum and Maximum bounds as appropriate. Additionally, you can change the Major units that control the spacing between the gridlines. To remove space between the data points and the top/bottom edges of the plot area, format the vertical y axis in a similar manner. Select the plot and click the Chart Elements button. 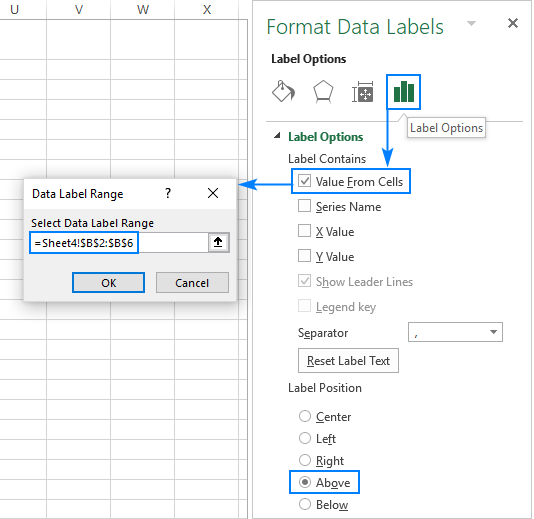 Select the Value From Cells box, and then select the range from which you want to pull data labels (B2:B6 in our case). If you'd like to display only the names, clear the X Value and/or Y Value box to remove the numeric values from the labels. Specify the labels position, Above data points in our example. When two or more data points are very close to each other, their labels may overlap, as is the case with the Jan and Mar labels in our scatter diagram. To fix this, click on the labels, and then click on the overlapping one so that only that label gets selected. Point your mouse cursor to the selected label until the cursor changes to the four-sided arrow, and then drag the label to the desired position. 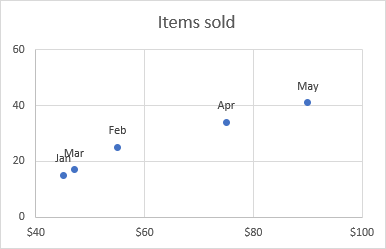 To better visualize the relationship between the two variables, you can draw a trendline in your Excel scatter graph, also called a line of best fit. 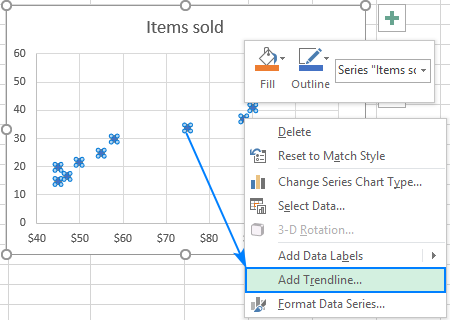 To have it done, right click on any data point and choose Add Trendline… from the context menu. Excel will draw a line as close as possible to all data points so that there are as many points above the line as below. 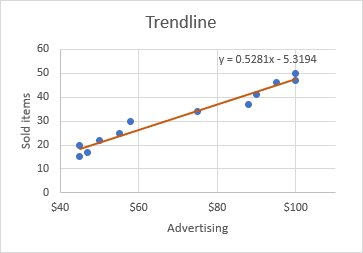 What you see in the screenshot above is often called the linear regression graph, and you can find the detailed guidelines on how to create it here: How to make a linear regression graph in Excel. As already mentioned, a scatter plot usually displays the independent variable on the horizonal axis and the dependent variable on the vertical axis. If your graph is plotted differently, the easiest fix is to swap the source columns in your worksheet, and then draw the chart anew. 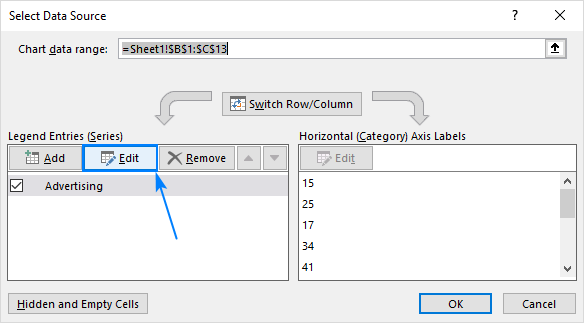 Right-click any axis and click Select Data… in the context menu. In the Select Data Sourcedialog window, click the Edit button. Copy Series X valuesto the Series Y values box and vice versa. Tip. To safely edit the contents of the Series boxes, put the mouse pointer in the box, and press F2. Click OK twice to close both windows. 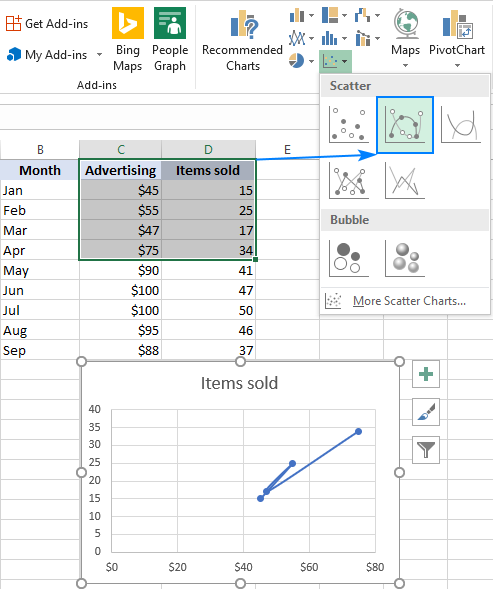 That's how you create a scatter plot in Excel. In our next tutorial, we will continue with this topic and show how to quickly find and highlight a certain data point in a scatter graph. Please stay tuned! 4 Responses to "How to create a scatter plot in Excel"
Also, I have never said this so why am I getting a duplicate response? Just click anywhere on the chart for the plus button (Chart Elements button) to appear. And sorry for the "duplicate response" message, our webmaster is working on it already. 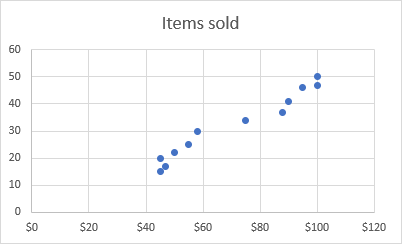 If I have a set of connected sample data for x and y values that varies in size, but I want them to be plotted in order of numerical size, how do I sort them without manually moving around the data entries. As an analogy in letters I have the letters 'b' , 'f' and 'd' but I want to plot them in alphabetical order so they appear from left to right as 'b','d','f'. The corresponding y-values would obviously have to follow so they stay with their x-value. I'm trying to show my labels in a X & Y-chart and I thougt i found the solution when finding this site. Others say you need to write a macro of your own. Series namn, X value, Y value and Legend key. I don't see the "Value from Cells"-box.